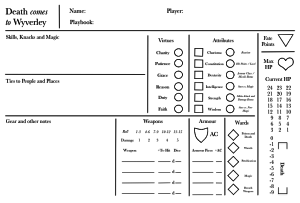 In the last couple of posts I considered Southern-Oriented Character Sheets for D&D, and also splitting the Village and Adventure phases in Beyond the Wall. This should prioritise the (freeform, descriptive) skills over the (crunchy, esoteric) attributes. The only problem is if the attributes are used to resolve skills then the player has to look up and down the character sheet to map numbers to skill descriptions — but this isn’t any worse than the current BtW sheet. 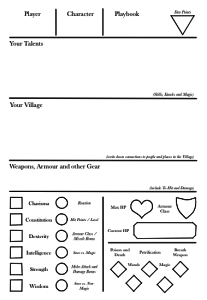 Next, here’s a sheet to separate the Village Community and Adventure Phases. The traditional D&D attribute bonuses (circles, left) map right onto the social advantages (circles, right). Rotate the sheet 90 degrees anticlockwise and you’ve got the Village sheet; rotate in the opposite direction and you have the Adventure sheet. You could even fold the sheet in half down the vertical double line in the middle. Note that the six interaction markers for the Village come from the six attributes, not just from Charisma. This requires rethinking what Charisma does in the adventuring portion — mostly it should involve making favourable impressions on strangers. In the village charm matters less since all the characters should be accepted by the village; instead the markers reflect how the Village sees them. Are they Empathic? Graceful? Reasonable? If you want to let players choose how their attributes reflect on the village, you could give each marker several options (per the previous post) — a high DEX could mean the character is graceful, precise, or conniving, for example. 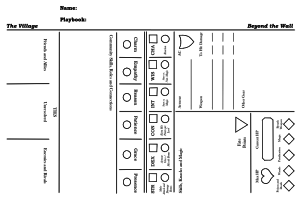 Finally, this is my sheet for Death Comes To Wyverley, my in-progress Garth Nix / Sabriel influenced BtW game. In this one all the characters will be female members of Wyverley college, which replaces the village as a stable base for social interaction with other pupils, teachers, the groundskeeper, the nearby village and so on. I haven’t quite decided how the Virtues work yet, but the damage system is inspired by Sine Nomine’s Scarlet Heroes — the better the weapon the bigger the die, and the more chance of doing more damage. This is partly to keep the hit point damage always in the low integers, for reasons given in my recent play report for BtW. To balance this out I plan to keep HP increases at a flat +1 per level for all classes. The nine states of Death correspond to the nine Precincts, naturally. I notice you mention prioritising flavour over crunch. I always assumed that wasn’t possible in D&D; has it become possible in the more recent iterations, or are you as a GM making some pretty radical changes to the basic mechanics here? The proposals for Beyond the Wall aren’t so much a radical change as a radical glueing together of the core BtW game with a very light Apocalypse World system for the non-adventure phase. I’d say it’s totally possible to reduce the crunch, as various OSR reimaginings have done (BtW, LotFP). D&D 3e is terribly crunchy, by comparison. The great thing about the OSR is being able to lift innovative new mechanic from, say, Scarlet Heroes and plug them right into other systems. But then why stop there? You can layer storygame procedures right on top. Of course if you don’t want to engage with the basic D&D tropes like saves and AC then it won’t be for you no matter how simple they’ve made it. Play something else instead like Everway. I recommend BtW anyway, it’s less than a fiver with lots of free stuff! Magic is way simpler. I managed to run a complete dungeon including character gen in 1h30 at 9 Worlds this year.